From June until August, the Resilience Project is putting the work of 50 Indigenous women artists on 167 billboards across the country to show Indigenous women are visible, powerful and should be celebrated. Artists are reclaiming space in inner cities and on highways where many Indigenous women have suffered violence or disappeared. 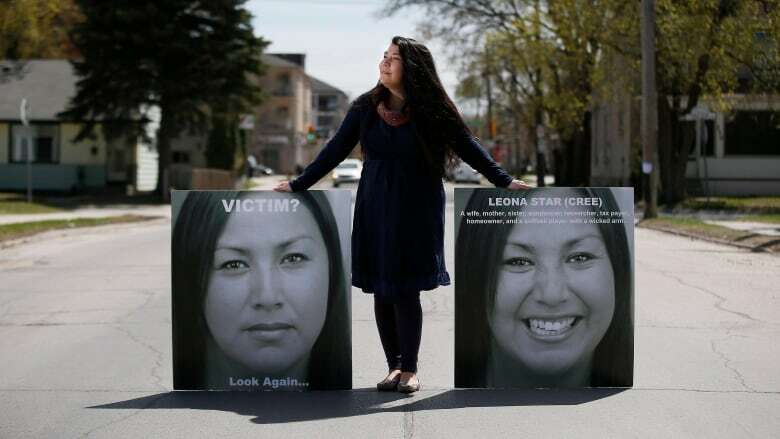 Two of the billboards will be on the Highway of Tears, a 700-kilometre stretch of road in northern British Columbia where numerous Indigenous women have been murdered or disappeared. The project, which includes photographs, paintings, and multimedia pieces, was produced by the Winnipeg centre Mentoring Artists for Women's Art as a response to the Truth and Reconciliation Commission on residential schools. "Resilience for this project is not just the narrow dictionary definition. It's embodied as endurance, adaptability and sovereignty. It's strength. It's not about being a victim," said curator Lee-Ann Martin. "It's about these women standing as defenders of their cultural sovereignty and proudly expressing that." Racism and exclusion have been part of the development of Canada and Indigenous women specifically have been disenfranchised and misunderstood, Martin said. Indigenous women couldn't vote federally until 1960, lost their status and rights when they married outside of their communities and, in the art world, their work was classified as crafts, she said. Artist KC Adams's Winnipeg home is adorned with different photo portraits, each with a unique story. Adams said Indigenous women are often only defined through stereotypes. "I know a lot of incredible Indigenous females who are going out every day and showing how to lead a good life and yet they are labelled with this victimhood," said Adams. "This is really a conversation starter on how we need to change our point of view." The Cree and Ojibway artist uses two images in her Perception photography series, which was initially displayed in Winnipeg, to contrast societal labels with ones Indigenous women give themselves. A black-and-white image shows an Indigenous woman and asks whether she is a victim. Another shows the same woman, with a big smile, describing her as a wife, researcher, homeowner and "softball player with a wicked arm." The photos will be on billboards throughout the country and Adams said there is significance in placing them in areas where Indigenous women have faced discrimination and felt fear. "It's super important that we reclaim these spaces and show a different point of view, different perspective and show how powerful we actually are and how we are leaders in our community." Anishinaabe, Dakota and Mé​tis artist Lita Fontaine said when she was beginning her career, no one talked about the trauma of residential schools and the Sixties Scoop, let alone how women experienced either. She said it was hard to gain respect as an Indigenous artist, but being included in such a large and visible exhibition is going to "change the landscape." "It brings us in the forefront, finally, because we need to have that voice." Her photograph titled "Mni Wiconi — Water Is Sacred" shows a 2016 demonstration opposing pipelines. Behind a large banner, people hold images of Thunderbird Woman, which Fontaine said has become a powerful symbol for the Indigenous environmental movement and for women. To Fontaine, resilience is all about "bouncing back, reclaiming and fighting for what you believe in within yourself and that culture you are from. "It's innate. It's just in us. It's natural," she said. "Resilience is my mother. It's the grandmothers ... It's the daughters."